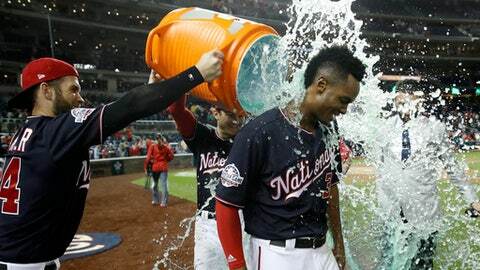 WASHINGTON (AP) Nationals center fielder Michael Taylor hasn’t had many good days this season. He hopes Tuesday night’s performance is a sign of things to come. ”Wrong pitch,” Padres manager Andy Green said. ”(Strahm) shook the catcher three times to get to that pitch. Reliever Wander Suero replaced Hellickson and recorded one out before surrendering Franmil Reyes‘ single to center. Catcher Pedro Severino fielded Taylor’s throw and tagged Pirela at the plate, but the runner was initially ruled safe. Washington challenged the play and replay overturned the call. Soto singled in the second inning but was picked off first base. He hit a three-run homer in Monday’s 10-2 rout over San Diego and reached base six times in eight plate appearances over his first two career starts. Padres: OF Hunter Renfroe (right elbow) was 1-for-3 while playing nine innings in right Monday for Triple-A El Paso. He’s hitting .150 (3 for 20) during his rehabilitation assignment. … C Austin Hedges (right elbow) also played nine innings for El Paso on Monday, going 0 for 3 with a walk in his first rehab game. … Manager Andy Green said OF Wil Myers (strained oblique) has yet to resume baseball activities. Myers was placed on the disabled list April 29 and has played in only 10 games this season.